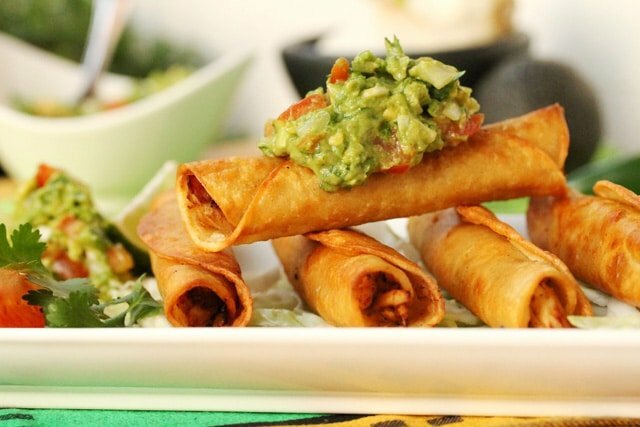 Taquitos are the best finger food. They’re like having nachos with meat rolled up in them all in one crispy bite. They’re a great way to repurpose leftover meat too. Just add the meat in the middle of a corn tortilla, roll the tortilla up and into the skillet the taquito goes to get crispy and delicious. I think the trickiest part about making taquitos is to get the corn tortilla pliable enough to roll it around the meat tightly without the tortilla breaking apart or unrolling. 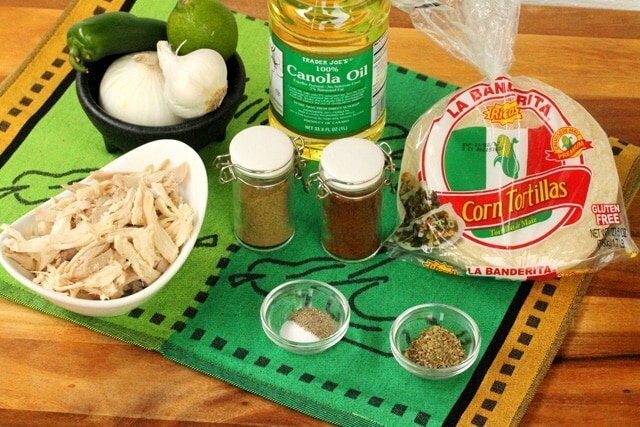 In this recipe the corn tortillas are warmed up super quick in a microwave to soften them up which works nicely with most types of corn tortillas. 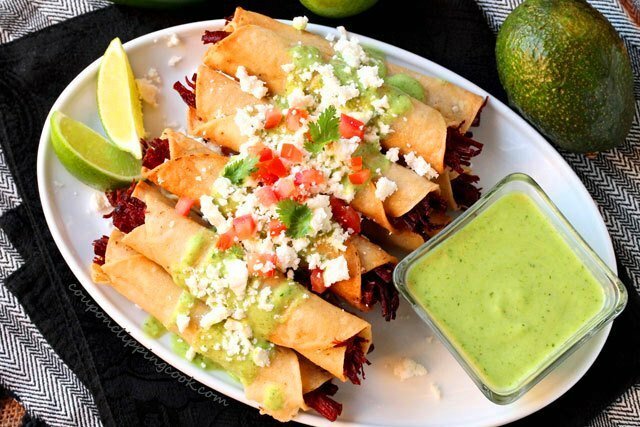 Here’s a recipe where the corn tortillas are dipped in warm canola oil for a quick moment to softened them up before rolling “Corned Beef Taquitos with Avocado Sauce” (also in this recipe there’s a really good recipe for avocado sauce that tastes heavenly served on top of taquitos). 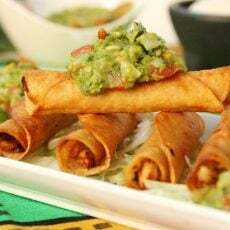 Taquitos also taste amazing with guacamole and pico de gallo. 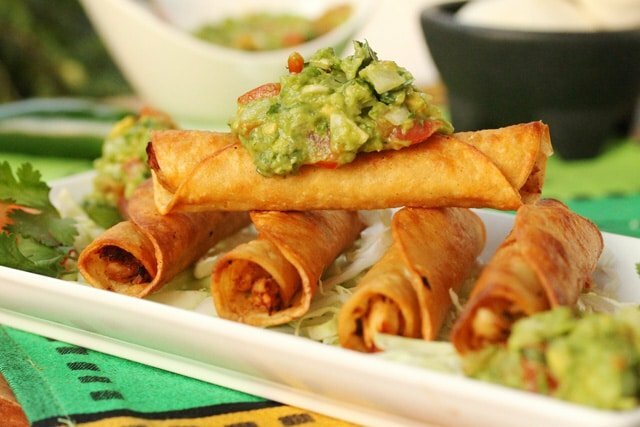 And of course salsa and taquitos are a match made in heaven. 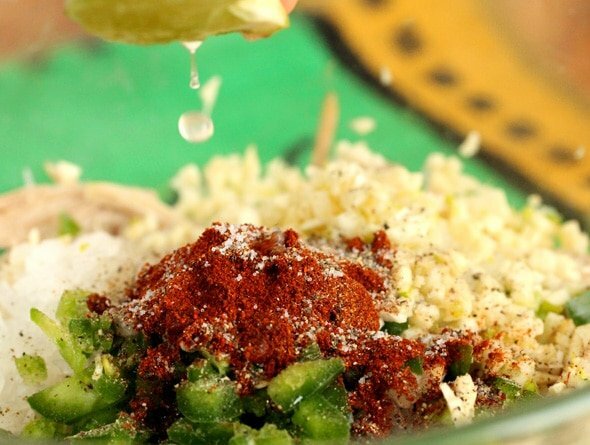 Here are some quick and easy fresh salsa recipes you may like “Cilantro and Garlic Salsa“, “Roasted Garlic Tomato Salsa“, “Salsa Verde” and “Tomatillo and Green Chili Salsa“. 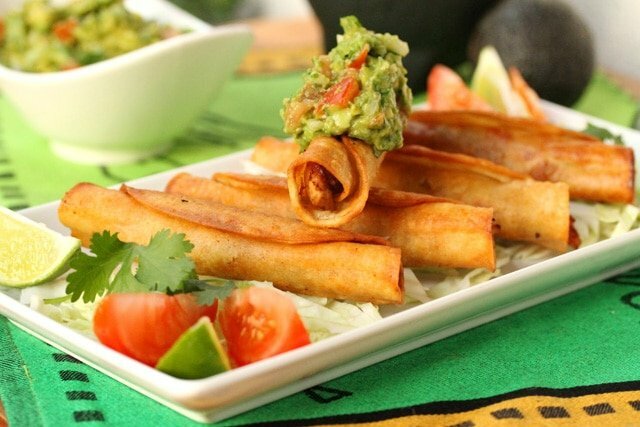 These taquitos are filled with shredded cooked chicken, spices and lime juice. 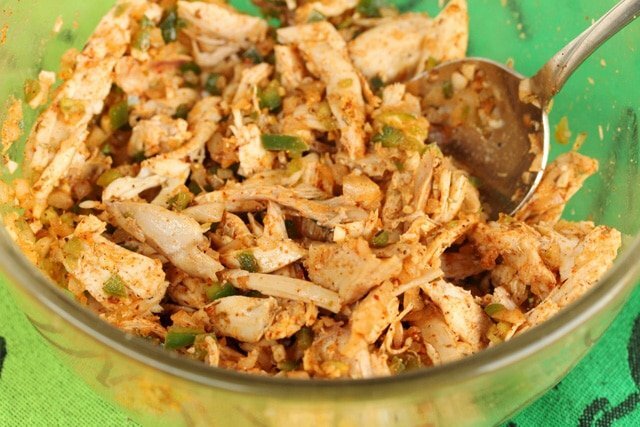 The spicy chicken in combination with the lime juice tastes wonderful together. 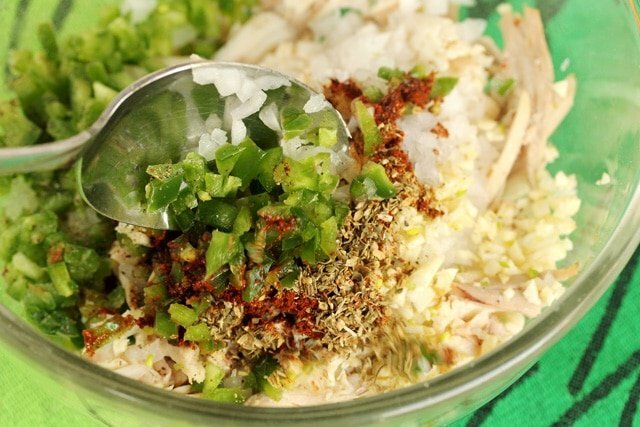 For the Filling – Add the cooked shredded chicken in a medium size bowl. Then dice the onion (about ½ of a small to medium size onion), and add it to the bowl. 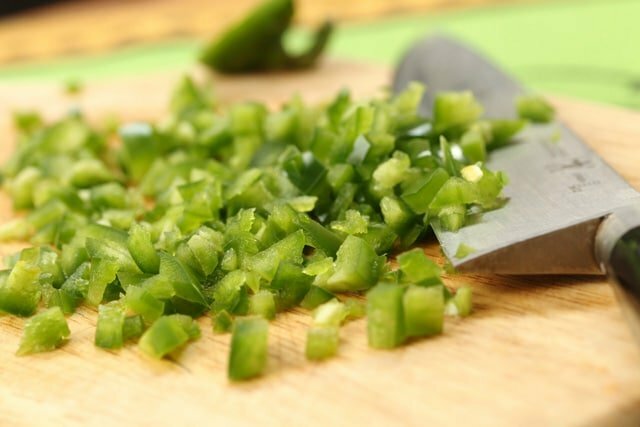 Cut the jalapeno pepper in half and remove the seeds. 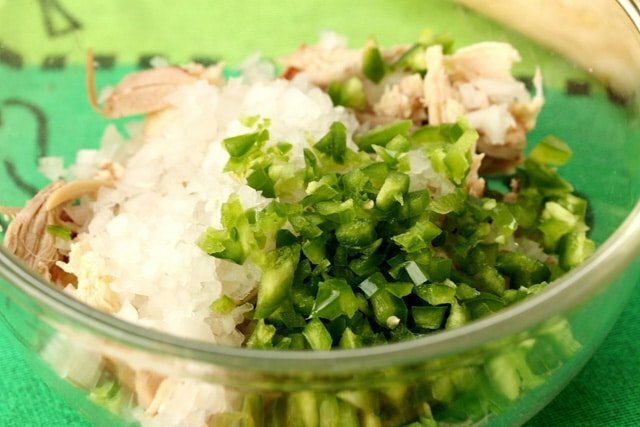 Dice the jalapeno and add it to the bowl. 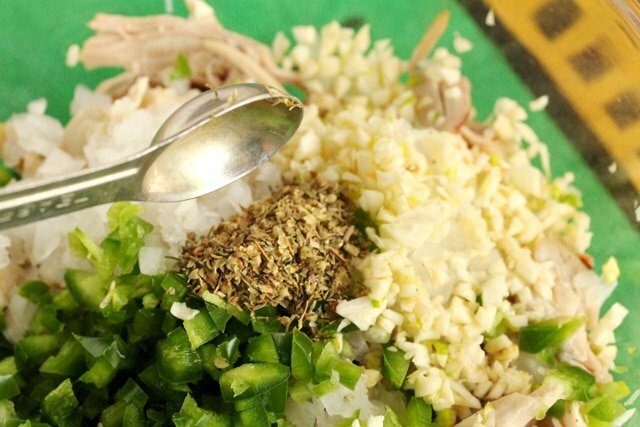 Next, dice the garlic and add it to the bowl. and add the juice to the bowl. 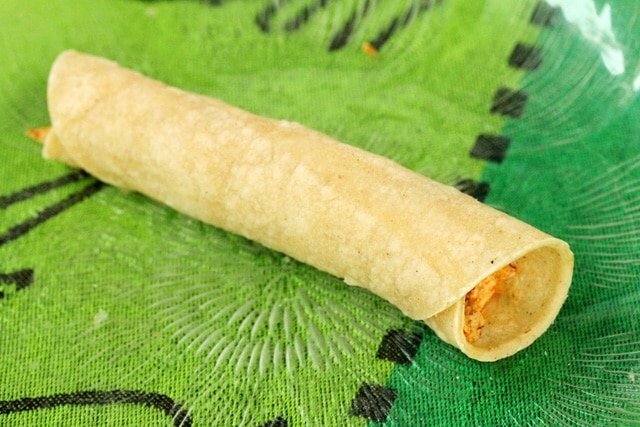 Filling the Taquitos – Then lay a tortilla on a plate and heat it uncovered in the microwave for about 20 seconds to make the tortilla pliable. As soon as you remove it from the microwave turn the tortilla over so the bottom side doesn’t get too moist from the steam. 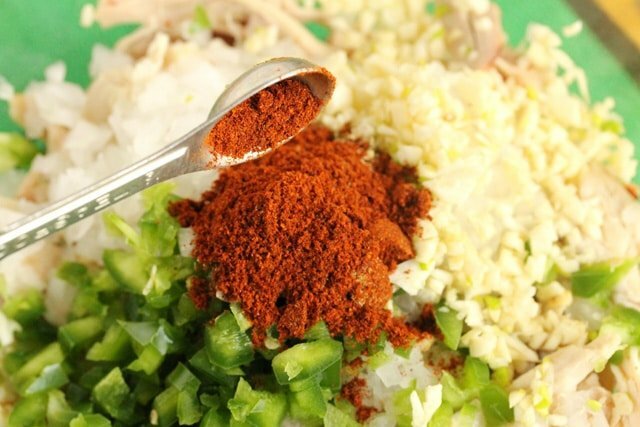 Next lay about 3 tablespoons of the chicken mixture in the middle of the tortilla. roll the tortilla over the chicken as tight as possible. If the tortillas are not pliable enough to stay rolled up, you can stick a toothpick in them so they don’t open up when cooking. Lay the tortillas with the seam side down on a plate to keep them tightly rolled. 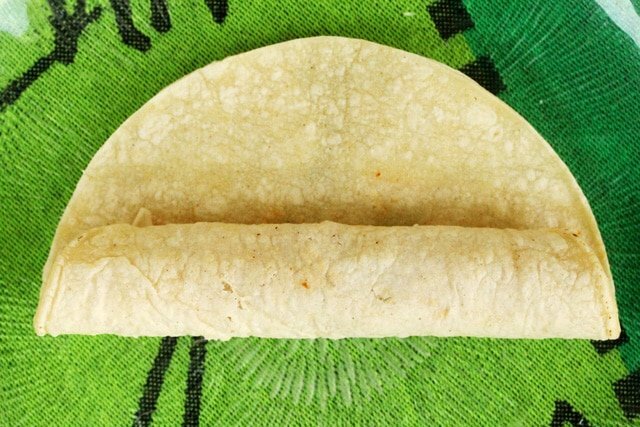 Continue to fill and roll each tortilla in the same way. 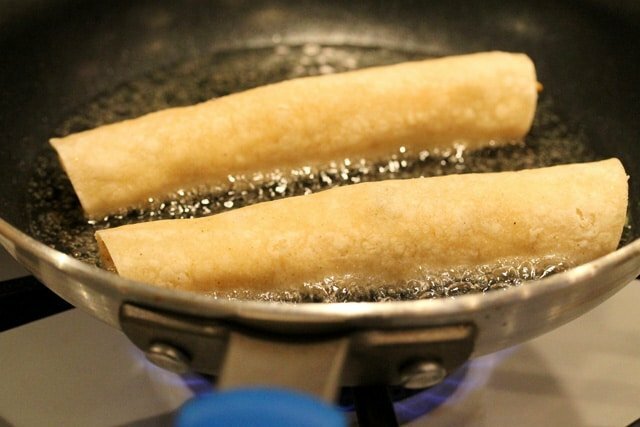 Cooking the Taquitos – Heat a skillet on medium heat. Add the canola oil. 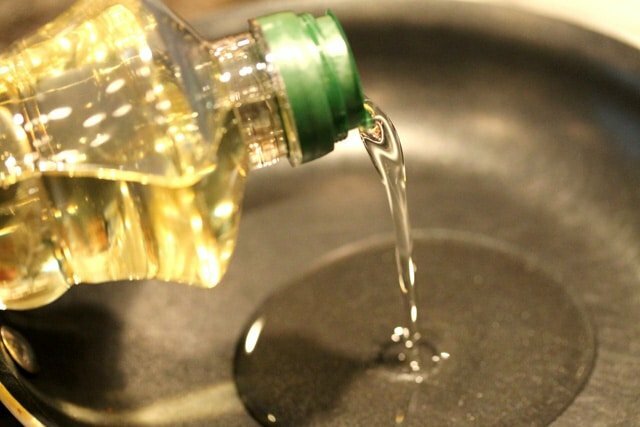 If you’re using a small skillet add about ¼ cup of oil or just enough so the oil is about ½ inch deep in the pan. For a medium size skillet add about ½ cup of canola oil. Put a tiny piece of a tortilla in the oil and when the oil starts to bubble, carefully put the taquitos in the skillet seam-side down. Depending on the size of skillet, the taquitos may need to be made in batches so not to overcrowd them in the pan. 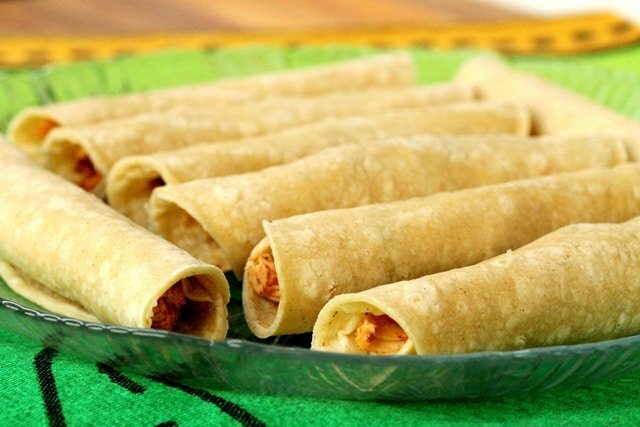 Let the taquitos cook with the seam sides down until the bottom sides turn a golden color. Then turn the taquitos letting each side cook until the tortilla is a golden color. 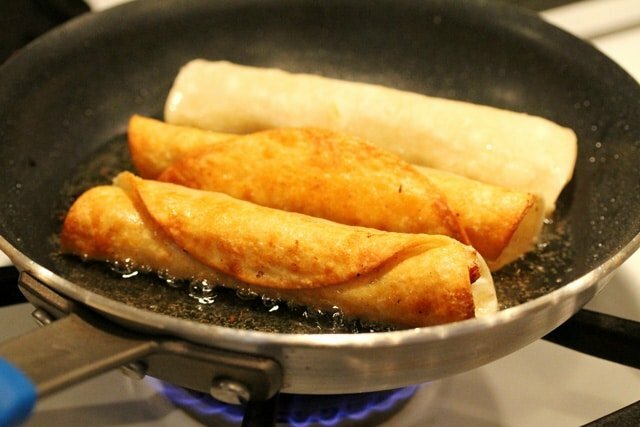 Transfer the golden crispy taquitos from the skillet onto a paper towel-lined plate to drain off any excess oil. 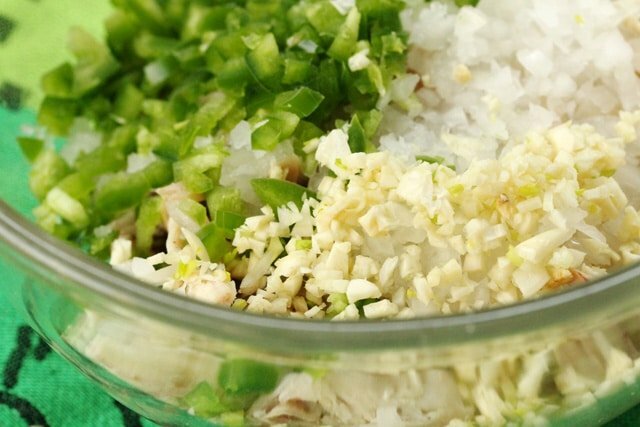 Serve warm with guacamole, pico de gallo and, or salsa. Then enjoy each and every crispy bite. 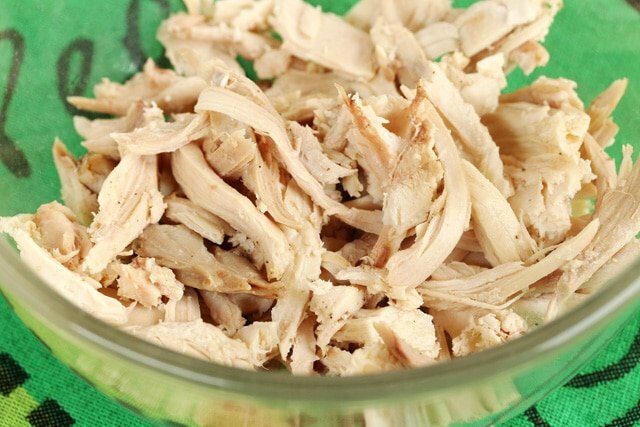 A delicious way to repurpose leftover chicken, pork or beef. 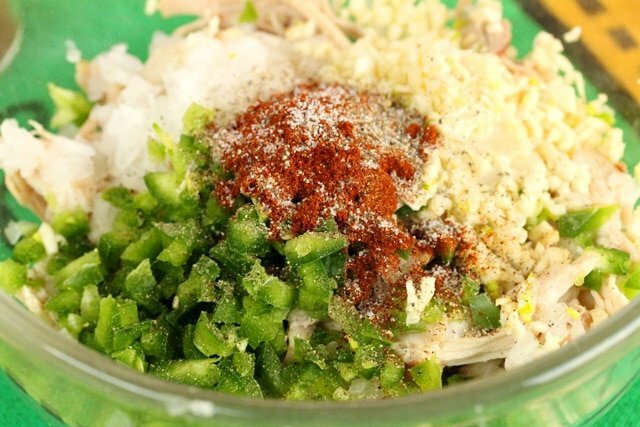 For the Filling - To a medium size bowl, add the cooked shredded chicken, onion, jalapeno, garlic, dried oregano, cumin, chili powder, salt, pepper and lime juice. 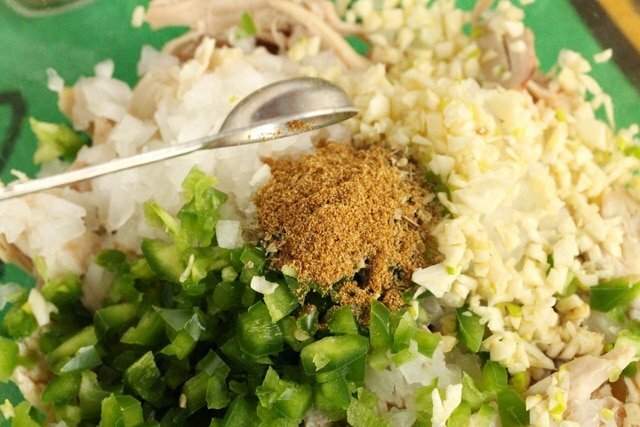 Stir together so that the chicken is coated with the spices. 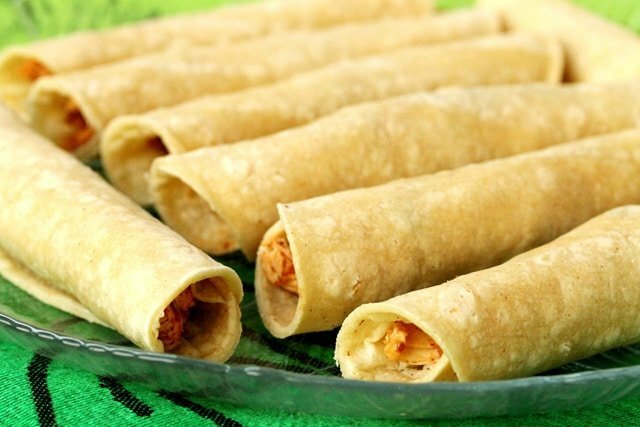 Rolling the Taquitos - On a medium size microwavable plate, place a tortilla and warm it in the microwave just long enough to make it pliable (about 20 seconds). Remove the tortilla from the microwave and turn it over so that bottom side of the tortilla doesn't get too moist from the steam. 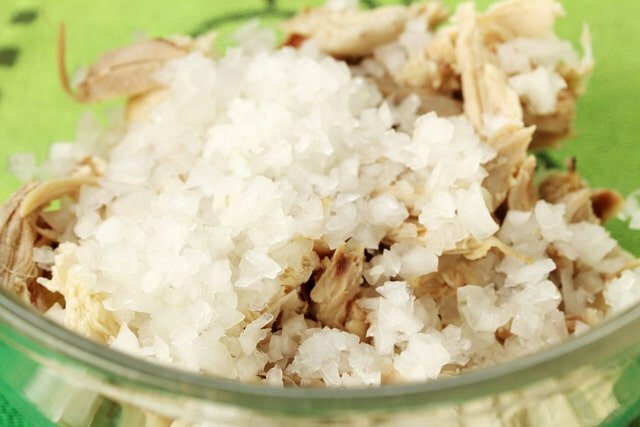 In the middle of the tortilla, lay about 3 tablespoons of the chicken mixture in a line shape from left to right that stops about 1 inch from each side of the tortilla. 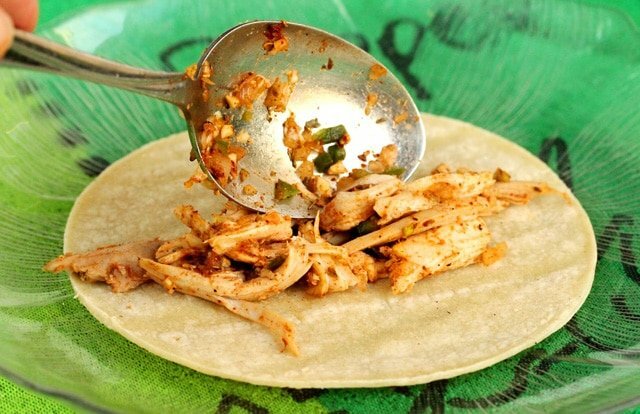 Roll the tortilla over the chicken as tight as possible. If the tortillas are not pliable enough to stay rolled up, stick a toothpick in them so they don't open up when cooking. 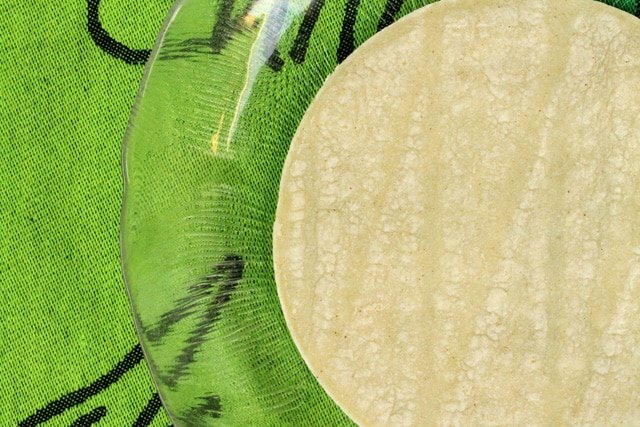 Lay the rolled tortilla with the seam side down on a plate to keep it tightly rolled. Continue to fill and roll each tortilla in the same way. Cooking the Taquitos - Heat a small to medium size skillet on medium heat. Add the canola oil. 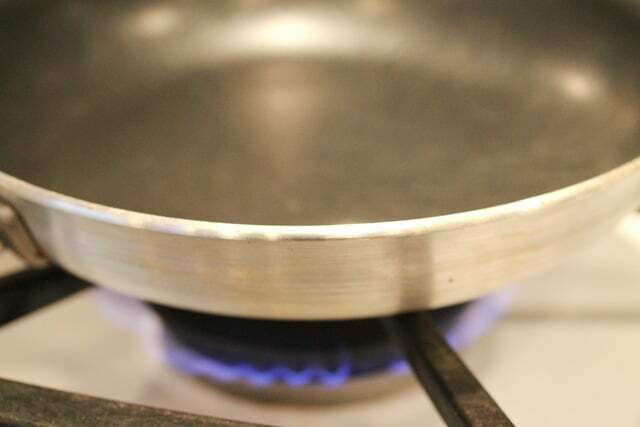 If using a small skillet add 1/4 cup of oil or just enough so the oil is about ½ inch deep in the pan. For a medium size skillet add 1/2 cup of canola oil. Drop a small piece of tortilla in the pan, when it bubbles, then carefully add the taquitos in the skillet seam-side down. Depending on the size of the skillet the taquitos may need to be cooked in batches so not to overcrowd them in the pan. 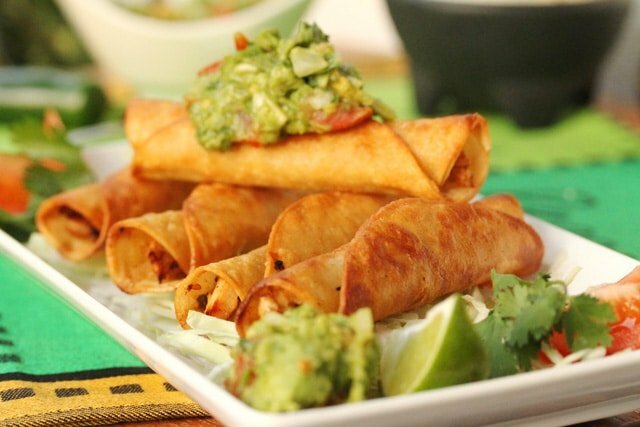 Let the taquitos cook with the seam side down until the bottom sides turn a golden color. Then turn them over letting each side cook until all sides of the taquitos are a golden color. 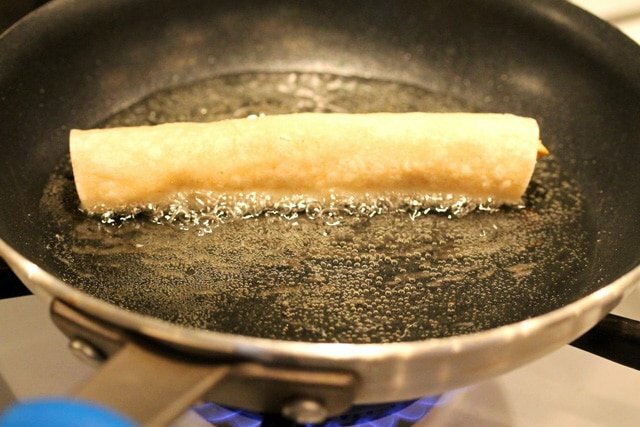 Transfer the taquitos from the skillet on to a paper towel-lined plate to drain off any excess oil. 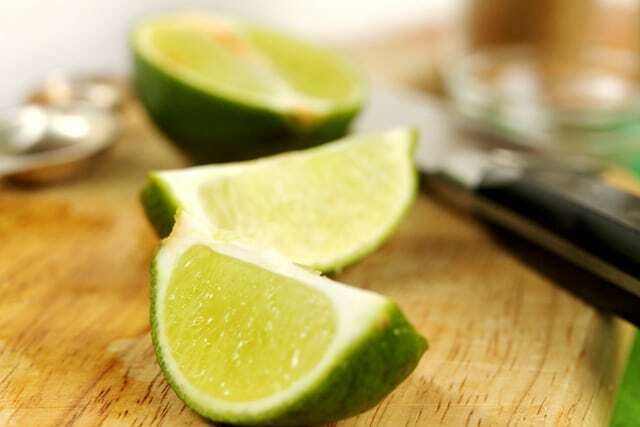 Serve warm with guacamole or salsa. These look delish, and my husband will love them because he’s supposed to eat them with his fingers! Hi Kari, LOL! Thank you and have a great weekend! You’ll be so glad you did! Have a great week! Hi Rina, thank you for stopping by and have a nice weekend!